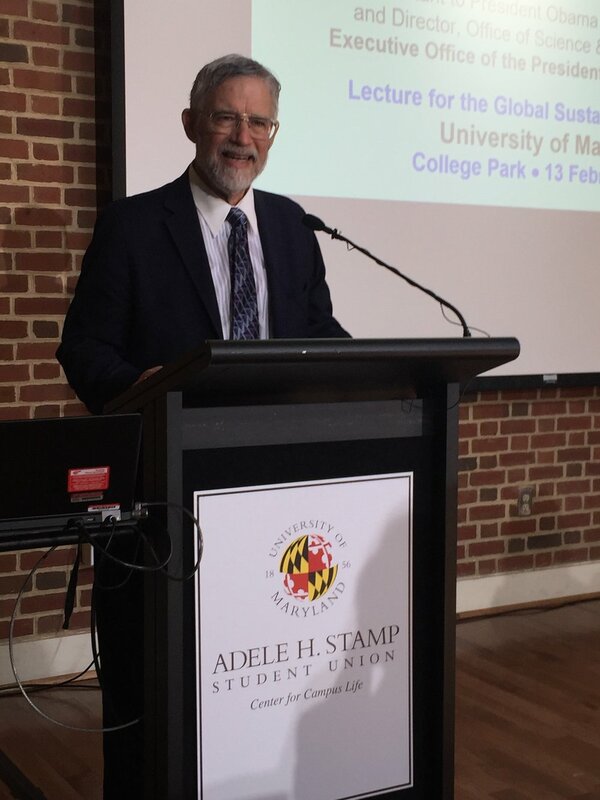 So said Dr. John Holdren to a packed house in the Prince George’s Room in Stamp Student during his visit to the University of Maryland on Tuesday, February 13. Sponsored by the new campus-wide Global Sustainability Initiative, the event highlighted GSI’s mission of establishing global leadership, advancing research, and promoting education to implement global sustainability goals through campus-wide collaborations. A globally renowned science and technology policy scholar and practitioner, Dr. Holdren was director of the White House Office for Science and Technology Policy (OSTP), co-chair of the President’s Council of Advisors on Science and Technology (PCAST), and science adviser to the president during the Obama Administration. Dr. Holdren’s talk, “Why the wafflers are wrong: addressing climate change is urgent (and a bargain),” addressed the urgent need for tackling climate change and responses to climate change deniers, wafflers, and those suggesting surrender. Currently the Teresa and John Heinz Professor of Environmental Policy at the Harvard Kennedy School of Government, Dr. Holdren discussed specific short- and long-term impacts of climate change, including the degree to which human activity is an underlying cause. As world population growth and lifestyle changes have led to a 22-fold increase in energy consumption over the past century and a half – with over 80 percent of energy needs still being met by nonrenewable coal, oil, and natural gas – the resulting spike in greenhouse gas emissions into the Earth’s atmosphere has led to a steady rise in global-average surface temperatures, along with a whole host of other effects. Indeed, Dr. Holdren noted that the term “global warming” could be a misnomer for these effects, preferring instead “global climate disruption.” The latter, he noted, illustrates the degree of unpredictability and non-uniformity in climate change’s effects, entailing changes in weather cycles, accessibility and availability of resources, and increases in the frequency and intensity of weather-related disasters. He noted that outright denial is decreasing as a result of these visible impacts and increased awareness, but that climate change “wafflers” – who do not entirely deny the obvious fact of climate change but understate or underestimate its current effects and future impacts – still abound. It can be more challenging to confront the wafflers’ comparatively more nuanced arguments and cynicism, but also increasingly more important to do so, he said. Although climate change is real and happening at a fast pace, Dr. Holdren concluded his talk with a hopeful quote and call to action, noting that “Trend is not destiny,” and taking audience questions on the relative importance of rising populations to climate change and the prospects for addressing the issue through the political process. The Global Sustainability Initiative, which hosted the lecture, is cosponsored by the University provost, vice president for research, and nine campus deans. The lecture also kicked off a full day of programming that included a deans’ luncheon with Dr. Holdren introduced by Provost Rankin and VPR Locascio, and a faculty roundtable on the importance and opportunity of science and technology policy collaborations at the University. The latter two events were both cosponsored by the School of Public Policy and the College of Computer, Mathematical, and Natural Sciences. A full videorecording of Dr. Holdren’s presentation can be found here.